How Much Are Citi ThankYou Points Worth in 2019? Citi ThankYou points are super flexible, which offers plenty of opportunities for great travel and rewards. Like many other reward programs, you can redeem Citi ThankYou points in different ways, including transferring to travel partners like JetBlue and Singapore Airlines, booking paid travel through the Citi Travel Portal, or for cash back and gift cards. How much are Citi points worth? In general, you’ll get a value of between 0.5 and ~6 cents per Citi ThankYou point. But it depends on how you redeem them! Here’s what you need to know about how much Citi ThankYou points are worth. At this time, there are really only 2 travel credit cards from Citi that earn Citi ThankYou points, and allow you to fully utilize the rewards program. Citi Premier – One of our favorite travel credit cards with a ton of bonus categories for earning more ThankYou points. The low annual fee (waived the first year) makes it a great way to get started with the Citi ThankYou rewards program. Citi Prestige – A premium travel credit card that offers valuable travel perks like 4th free night at any hotel through the Citi ThankYou Travel Center. This card isn’t accepting new applicants right now but it will be re-launching with new changes later this month. What Value Can You Get When You Redeem Citi ThankYou Points for Cash Back? The easiest way (but least valuable) way to redeem your Citi ThankYou points is for cash back. You can redeem your points for statement credit at a value of 0.5 cents per point. So 10,000 ThankYou points is worth $50 of statement credit. You can also choose to use points for a charitable donation at the same value. Both of these have a $50 (10,000 ThankYou points) minimum redemption requirement. Gift cards have a higher value of 1 cent per point. This means that you can redeem 10,000 ThankYou points for $100 worth of gift cards. There is a $25 (2,500 ThankYou points) minimum redemption. This is not the best way to use Citi ThankYou points because you can typically squeeze more value from them redeeming them for travel. If you’re looking for a cash back card to use frequently, check out our guide to the best cash back credit cards – these will almost always be a better option than redeeming Citi ThankYou points for cash back. What Value Can You Get When You Redeem Citi ThankYou Points for Travel Through the Citi Portal? The Citi ThankYou Travel Center is a simple way to redeem your points towards all sorts of free travel. This portal works similar to any other online travel agency you might use already such as Expedia, Priceline, and others, but allows you to complete the reservation by redeeming Citi ThankYou points. The portal offers redemptions for airfare, hotels, car rentals, and cruises. 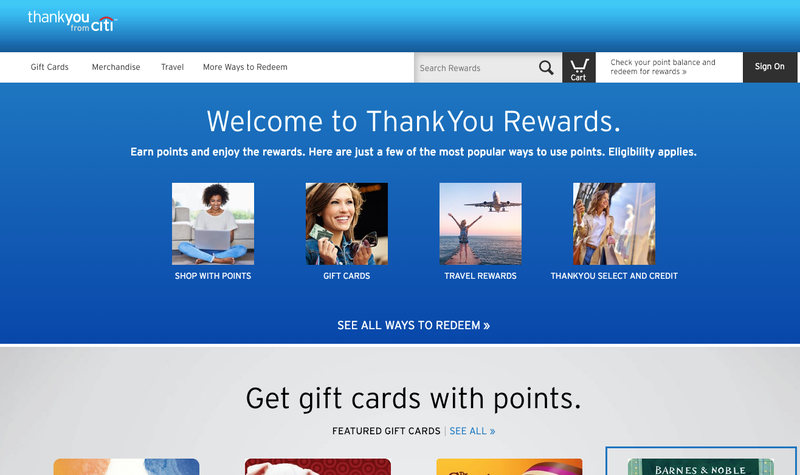 The value of your points will depend on the card you use to redeem them. The Citi Premier earns 1.25 cents per ThankYou point for airfare, hotels, car rentals, and cruises. This is on par with other popular travel cards in the same category, like the Chase Sapphire Preferred Card. ThankYou points redeemed with the Citi Prestige, on the other hand, are worth just 1 cent per point (except airfare, where they’re worth 1.25 cents per point until September 2019). What Value Can You Get When You Transfer Citi ThankYou Points to Travel Partners? One of the biggest benefits of having points in a flexible points rewards program, like Citi ThankYou, is that you often redeem points for more value by transferring them to travel partners. Each airline’s miles will have slightly different values depending on how you redeem them. But earning 1.5 cents per point is fairly common as an average across most of these partners, with some partners like Singapore Airlines yielding an average value of 2+ cents per point. 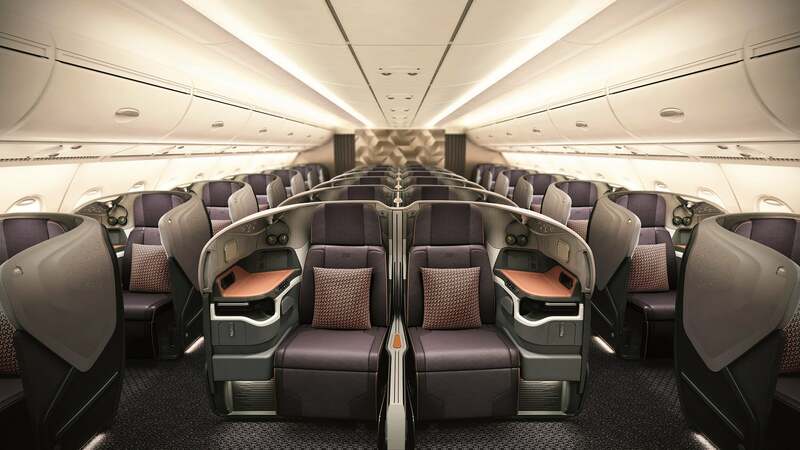 You’ll typically get the highest value by waiting for transfer bonuses, taking advantage of award sales, or by booking premium award tickets like lie-flat Business Class seats on international flights. Citi ThankYou points transfer to partners can be slower than other flexible reward programs, like Chase Ultimate Rewards. 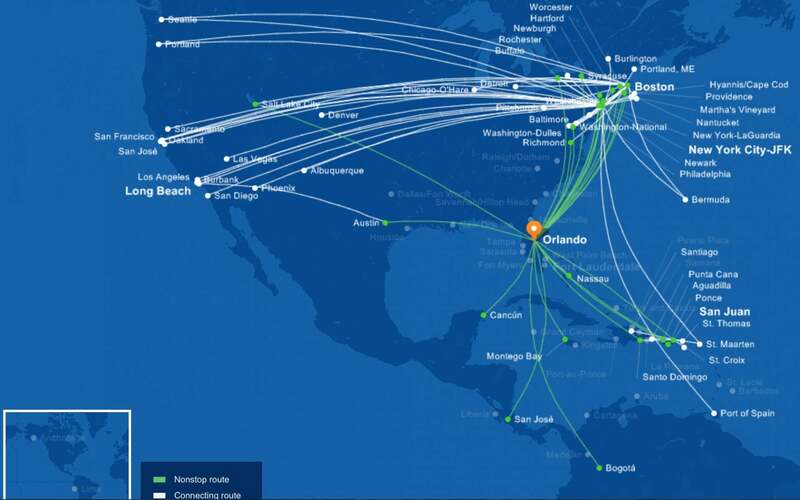 Only 3 of these partners (Avianca, Flying Blue, and JetBlue) offer instantaneous transfers. A few of these partners (Etihad and Thai Airways) can take up to a week! Most average a few days. This is worth remembering if you are looking to take advantage of one-day fare sales or last-minute tickets. You might notice that ThankYou doesn’t have any hotel transfer partners. 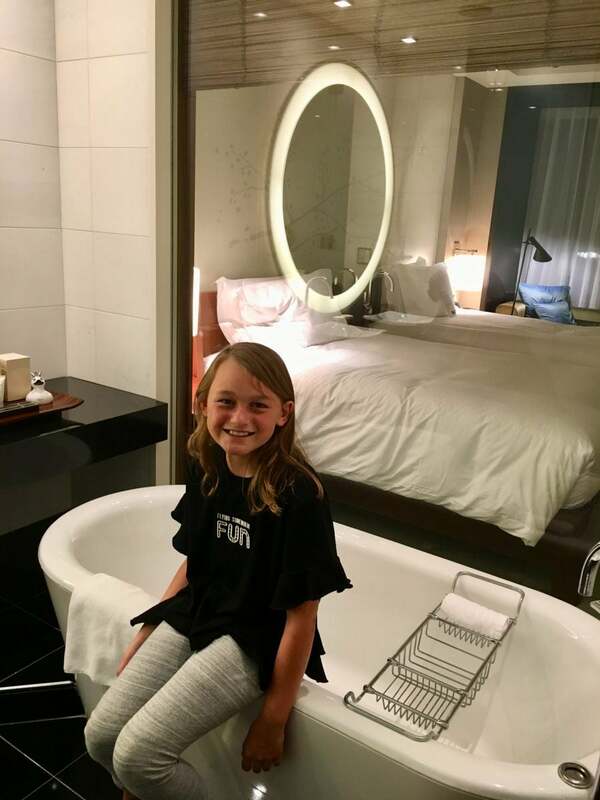 Folks looking to redeem their points for hotel stays can redeem their points through the Citi ThankYou portal, which offers many hotel options including boutique and non-chain hotels. For example, team member Jasmin redeemed points from her Citi Premier card for a luxury stay at the Conrad Tokyo last year. One area where Citi struggles is with domestic flights. I would really like to see them bring on a major domestic airline like American Airlines, Delta, United Airlines, or Southwest. This would make their transfer options even better. That said, you can transfer Citi ThankYou points to partners which are part of an airline alliance, then redeem miles for any airline within that alliance. For instance, you can transfer Citi points to Singapore Airlines to book United Airlines flights. 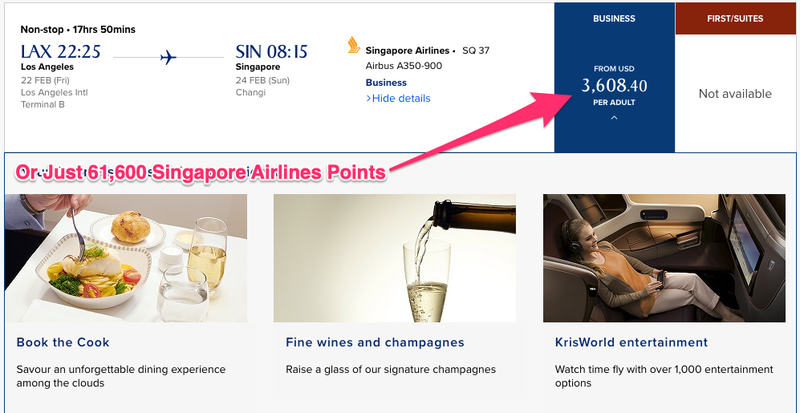 To demonstrate how valuable Citi ThankYou points can be, consider this sample booking from a recent award sale on Singapore Airlines. And because you can transfer ThankYou Points to Singapore Airlines miles within ~24 hours, you can take advantage of these quick deals to get tons of value from your ThankYou points. Los Angeles to Singapore in Business Class in This Example Costs $~3,608 or 61,600 Singapore Airlines Miles Thanks to an Award Sale. This Is a Value of Almost 6 Cents per Point! Flying Los Angeles to Singapore in Business Class costs ~$3,608 one-way in this case. You will be able to stretch out in lie-flat seats and enjoy the lengthy flight in comfort with delicious food. With the Singapore Airlines recent award sale, this flight was on sale for 61,600 Singapore Airlines miles each way. Because of the 1:1 transfer ratio, this is exactly 61,600 Citi ThankYou points too. This makes each point worth an incredible ~5.9 cents each ($3,608 cash price / 61,600 miles)! Considering an example of earning 3X ThankYou points at gas stations with the Citi Premier, this is a total of ~18 cents back per $1 (5.9 cents per point x 3 points per $1 = ~18 cents per $1) on these common purchases (or 18% return). Or imagine using the 5X ThankYou points per $1 on dining with the Citi Prestige (coming early 2019) which would yield ~30 cents per $1 spending (5.9 cents per point x 5 points per $1 = ~30 cents per $1)! These are absolutely astonishing reward values. Is Citi ThankYou the Right Program for You? 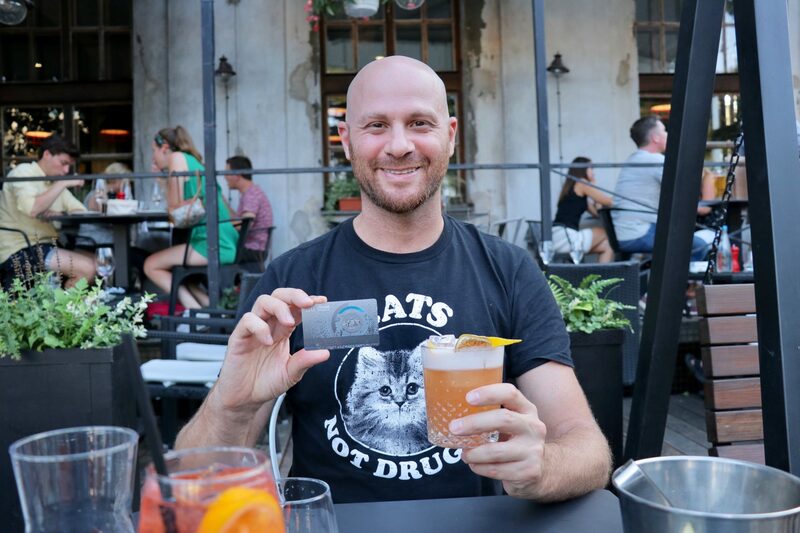 The most important thing to consider with the Citi ThankYou program is whether or not it fits into your travel habits. It’s slightly less flexible than other reward programs, meaning it won’t be a good pcik for everyone. For example, it lacks a solid domestic airline transfer partner. While it does offer JetBlue, they don’t have as many flights, or access to as many airports as an airline like American Airlines, Delta, or United Airlines. So if JetBlue doesn’t fly to your airport, it won’t do you any good. I think the fact that they don’t offer hotel transfer partners is another way in which this program is less flexible. While it is true that hotel transfer partners usually offer lower value than airline transfer partners (considering other flexible rewards programs), it is still nice to have the option. None of this is to say that Citi ThankYou isn’t a good deal. As stated earlier, some of these transfer partners, such as Singapore Airlines, can offer up to 5+ cents per point in value. And this is the underlying point. For people looking to fly where these airline partners (or their partners) go, the Citi ThankYou rewards program offers incredible value. But if your travel habits fall outside of what can be offered from the transfer partners, then a different flexible rewards program might make more sense and offer more value for your spending. Of course, you’re not obligated to lock yourself into one program either. Most of us on the MMS team collect points in the Citi ThankYou, Chase Ultimate Rewards, and AMEX Membership Rewards programs simultaneously. How Should YOU Use Your Citi ThankYou Points? Everyone is different and how you use points will depend specifically on how you prefer to travel. Citi ThankYou points offer a lot of flexibility and value. One of the best thing about the Citi ThankYou cards like Citi Prestige and Citi Premier is that they offer incredible bonus categories. So while I believe the average value of an individual Citi ThankYou point is slightly lower than other flexible reward points like Chase Ultimate Rewards and AMEX Membership Rewards, this lower value is offset if you spend a lot in bonus categories. For folks with the Citi Premier card, the travel portal is a good option if you don’t want to worry about award charts, or are looking at booking last-minute flights. It is also your only option for booking hotels since Citi doesn’t offer any hotel transfer partners. The 1.25 cent per point value is reasonable, especially considering how easy it is to redeem them. But transfer partners will still be a better option when you are looking to get the most value on airfare, because your average value across all the transfer partners is ~1.5+ cents per point, higher than what the portal would offer you. Those with the Citi Prestige card are going to want to focus almost all of their effort towards using Citi’s transfer partners. This card only offers 1 cent per point within the travel portal (1.25 cents per point on airfare until September 2019), making it a much bigger loss in value compared to what is possible with transfer partners. Flexible Citi ThankYou points are worth 0.5 to ~6 cents each, depending on how you redeem them. The Citi Premier and Citi Prestige (not currently accepting applications), are currently the only 2 cards that allow you to fully utilize this rewards program. How much your Citi points are worth will completely depend on how you redeem your points. Let us know if you have a favorite Citi ThankYou points redemption! I want to turn in a receipt for cash value of personal pts used for business trip- is there a chart to show what I would have paid for a certain flight which is not offered on cash only schedule? Is it a good idea to merge your Citi Prestige Thank you points with your Citi Thank you premier points tonget the better 1.25 value for Travel? You could definitely do that! That’s a better deal for hotel stays. The only down side would be if you wanted to redeem for a stay with the Prestige 4th night free perk – then the points would have to be in your Prestige account. It would work out to a 25% off with either card. Still, I’d run the numbers both ways to see what’s more beneficial as far as points options. For airfare, it doesn’t matter until later this year (September 2019) when the Prestige points value decreases to 1 cent each. You can use either card account to get the same value – for now. Just note, once you combine accounts it cannot be undone. But you can transfer between accounts all you like.